What is your favourite movie-themed online slot? These are thrilling video slots based on the biggest blockbuster movies of all time! What’s up with movie themed online slots? What your favourite movie of all time? How would you like it your favourite movie was turned into a money-making machine – a slot? There is no escaping the effects of movies in this era. A movie hits and companies rush to franchise clothes, memes and games. The following online slots are top-notch. You can look forward to meeting some of the greatest actors and movie characters in these games. From the ever handsome George Clooney to Henry Cavill (superman), Heath Ledger (The Dark Knight) and all characters from Planet of the Apes. Pretty exciting right? Do you ever wish that you were paid every time you watched a movie? Here is your chance to get paid for spinning the reels with your favourite actors and actresses. 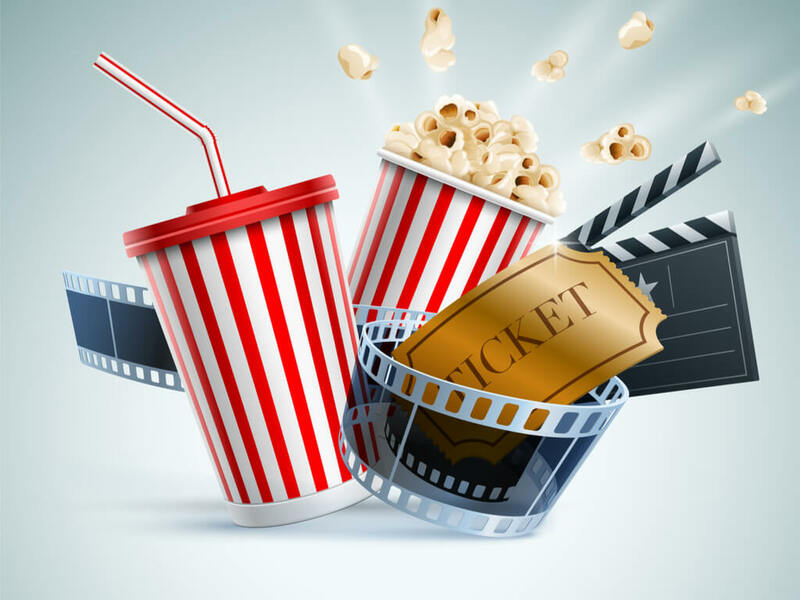 Here is a wide selection of different film genres that also come with video slots. From the scary ones, which raise the hair at the back of your neck to action-packed adventures and comedies. Do you remember reading the story of Hensel and Gretel and the witch? This slot is based on the 2012 film starring Gemma Arterton and Jeremy Renner. If you are in the mood of killing some witches, this 5 reel and 10 paylineslot by iSoftbet is a great place to start. For 10p per spin, you get to enjoy a Free Spins feature and wilds which expand and remain frozen throughout the duration. Land 5 Gemma (Hensel) symbols and stand to win 3000x your stake! We cannot speak of top movie-themed slots without mentioning Pink Panther. This 2006 film won our hearts with the great performances by Steve Martin and the ever gorgeous Beyoncé! Spin this reels and join the cunning Pink Panther for a splash of bonus games. Follow the Pink Trail Bonus game, where Inspector Clouseau goes in search of his stolen diamonds. Prove your panther skills as you collect your Free Spins and 2 progressive jackpots. Play Gladiator Jackpot for some pretty fierce wins! Gladiator Jackpot is similar to the original Gladiator slot but it has a twisty progressive jackpot! With just 25p to £1,250 per spin, you stand to win 5000x your stakefor 4 Emperor Symbols on an active payline. Join Russel Crowe in his quest for power and blood and claim your 2 bonus features. Land 3 Coliseum scatter symbols and trigger your bonus game! Join these super heroes and save the world with this 5 reel, 3 row and 25 payline online slot. This slot has all kinds of super heroes you could think of. From Superman to Wonder Woman, Batman, The Flash, Aquaman, Green Lantern, The Flash and Martian Manhunter. Yes, Superman is the highest paying symbol. Hit 5 on a payline and get away with 300x your stakeon a single spin. There there is the Super Hero Power-Up bonus and the Attack on Metropolis Free Spins. You could always use the Gamble feature to play for more wins! Henry Cavill won the hearts of viewers and comic book fanatics in 2013 when he starred in the legendary film – Man of Steel. The ‘man who can never be defeated’ is back, on this 5 reel, 3 row and 25 payline slots by Playtech. The battle begins as soon as you start spinning, with Henry Cavill’s superman and General Zod on either sides of the reels. You will also see Clark Kent’s parents, a school bus, a figher jet, the Daily Planet newspaper and Kent’s mailbox. There’s plenty of special features to scoop – from the Superman/Zod Wilds to the Battle for Earth Free Spins, Krypton Free Spins, World Engine Bonus and Progressive Jackpot. The millennials might not be so familiar with comedian Jim Carrey but you could never go wrong with any of his movies. Ace Ventura Pet Detective is a 5 reel, 3 row and 243 ways-to-win, based in Carrey’s 1995 movie. Join Jim as, the local vet, as he goes on a trail to locate an abducted dolphin, which is also the mascot of the US football team. At the end of the search are some crazy special features – Ace Wild bonusand the animal Free Spins. Now, now, hold your horses aficionados! Zac Efron and The Rock (Dwayne Johnson) are not in this slot. This game offers us the original baywatchers – Mitch, CJ, Cody and Caroline. Play this 5 reel and 15 payline online slots for 25p to £750 per spin and surf the waves to hot bonuses and attractive free spins. We are talking about the Symbol Replacement feature, Teamwork feature, Tidal feature, ‘More stacks’ and the Free Spins feature. For all female gamblers out there, Bridesmaids slot exists and it also comes with some pretty wins! The Bridesmaid movie was a hit – with ladies Lilian, Annie, Megan, Helen, Rita and Becca taking us on a dramatic roller-coaster. The crazy girl group is back again, this time on a 5 reel and 40 payline slot. They come carrying banquets of bonus features, including the Wheel Bonus, Magic moment, Friendship Free Spins, multipliers and an attractive jackpot. Speaking of which – you should stay tuned as the new season of Game of Thrones is about to start. We thank Microgaming for giving us Game of Thrones, a 5 reel and 15 payline slot with great graphics and gripping gameplay. You will be seeing the seals of the four main families; Baratheon, Lannister, Stark and Targaryen. Then there are the bonus features, free spins and wild multipliers which all give you a winning advantage. Back in 1993, Steven Spielberg gave us one of the most thrilling films of all time –Jurassic Park. Now it comes as a 5 reel and 243 payline slot that pays from both ways. Brace yourself as you fight dinosaurs like the Velociraptor, Dilophosaurus, a Tyrannosaurus Rex, a Brachiosaurus and Triceratops. Bonus features include Free Spins and the Alert Mode.You also get extra multipliers for every dinosaur that you land on the reels. He is known as the greatest and best martial arts actor to ever live. Now thanks to WMS Gaming, we have a 5 reel and 60 payline slot dedicated to the man. Do you know that Bruce Lee could do press ups using his thumb and index finger? Celebrate the legendary Bruce Lee on this game and enjoy playing with interesting symbols including; a scroll, vase, coins, golden hat and a dragon. Special features include Free Spins, crazy wilds and 60x multiplier. Vikings series is a detailed depiction of Ragnar Rothbrok, a farmer who fought and raided his way to becoming the King of Northmen. It was believed that Ragnar was chosen and protected by the gods. Meet his wife Lagertha, his brother Rollo and best-friend Floki, in their bloody and terrifying ventures on this slot. Raid the reels and win bonuses like the Hotspot, Shield Wall and Raid Spins. Pick a side in the 5 reel, 3 row and 20 payline Planet of the Apes slot by NetEnt. The Apes are on your reels to give you wins, just spin! There are two reels – the left set is called ‘Rise’ and the right reel is called ‘Dawn.’ It is like playing two games at the same time! Even the wild symbols are different. While the ‘Rise’ reel comes with a gold wild, the ‘Dawn’ side has a ‘red’ wild. Special features include – Stacked Wilds and Rise & Dawn bonuses.